The drone of the little airplane’s engine filled Jeffrey Barrow’s head and rattled him to the bone. Empty, snow-covered permafrost passed shapelessly below the plane, a solid mass that spread from one horizon to the next. It had been that way for hours, ever since they had flown through the mountains that separated settled Alaska from the barren wastes. In the distance, the sun dipped tantalizingly low on the horizon but refused to sink behind it in Alaska’s land of endless twilight. Jeffrey squeezed his hands. The rattling made his joints ache, as did the cold. Old war wounds that crisscrossed his body began to flare up. He grimaced and looked from to the passenger sitting across from him in the cramped cabin. A bear of a man wrapped in furs until only his eyes peeked out sat in front of him. His clumsy hands gripped a rifle. The man must have noticed Jeffrey’s nervousness, for he turned and laughed. “Don’t worry, it’s just for bears,” he said in heavily Russian English. Somehow, Jeffrey didn’t feel any better. He returned to glumly staring out the plane’s windows as the flight droned on. When he had been loaded into the puddlejumper that morning, he had assumed the flight was to the American consulate in New Archangelsk. Maybe even as far north as Juneau. Instead, he had been given an impromptu tour of the great Alaskan Republic. That is, he had seen the gleaming bank towers of Valdez and sleepy riverside factories of Zatop from their airport terminals during refueling and the rest from the sky—most of it little mining towns sticking out through clearings of the endless forests that blanketed the land to the south. Yet even the drab, grey mining towns had their charms compared to this endless white wastes. It was only the pilot’s announcement a few minutes later of, “We’re here!” that saved Jeffrey from total madness. As the rickety plane began to descend, battling headwinds the whole way, Jeffrey leaned back in his seat and sighed. All this way just for a meeting? Shortly after stepping foot onto the tarmac and leaving the pilot and bear guard behind, Jeffrey had been whisked away in a beetle-shaped blue car that buffed clouds of black smoke everywhere it went. He took the time to strip off his dark green parka in the back of the little vehicle. A burlap knapsack rested between his feet. Somehow the flight hadn’t managed to break any of the pens inside, and so his notebooks and pads remained unstained. With the parka off, his bright red press badge rested comfortably against the front of his gray suit. He’d been given it that morning, but it felt like a lifetime ago already. The car stopped in the center of the snow and ice-covered town and the driver made no move to let Jeffrey out. Sighing, he grabbed his bag and shoved his way out of the vehicle and looked up to see where he was. The sight that lay before him couldn’t have been more surprising if it tried. Rising from the ice wastes sprinkled with flurries of snow was a building belonging to a different world. Magnificent columns cut from stone towered above the frozen ground and supported a roof covered in bright red staccato tiles straight out of a Mediterranean villa. Carved into the stone above the glass doors that protected the inside from the cold was what must have been the town’s name: конецмира. End of the World. Situated among wooden buildings teetering atop stilts, it was an obvious destination for any reporter. Jeffrey jogged up its stairs. Notably, his eaten leather boots slapped against cold stone, not ice. Someone must have paid a fortune to have it cleaned off every day. He marveled that even the glass doors were warm to the touch. Heated from the inside, no doubt, to prevent them cracking and shattering in the cold. The doors were open, but so late in the day there were no workers inside. Yet, the lights were on, so Jeffrey crept in. The interior was lit by bright fluorescent lights attached to a surprisingly cramped ceiling in the building’s reception area. The walls rattled from what was likely the building’s heater. Jeffrey stared at the portraits of past Alaskan Ministers—and the Russian ones before them—that were proudly displayed on each wall. The rotund man laughed. “If you find anyone else here with the influence to drag a reporter up to this corner of the world, you let me know, okay?” he said, in what Jeffrey noticed to be almost perfect English. Jeffrey’s heart skipped a couple beats. Minister? He’d expected a representative to the American Consulate at most for a little column, but now he had the makings of a real story on the line. “Lead the way, Minister Durnovo” he declared. The interior of the building was a maze of marble corridors that clicked and clacked with every step the minister and Jeffrey took on them. Durnovo led him this way and that, down into the labyrinth that was his building until they arrived, at last, to the rear of his little palace at the top of the world. The room was as wide as a football pitch though only narrow enough for three men to stand side by side. It was a drawing room dominated by plate glass windows that extended overhead, up to the vaulted ceiling covered in shadow. In front of the massive length of glass were two plain burgundy chairs beside a wooden end table. “Please, sit down,” Durnovo said, taking the seat to the left while Jeffrey lowered himself into the chair on the right. There were cups of tea on the table, and Jeffrey took one without being offered. “If you don’t mind me asking, Mister Durnovo, what exactly is this?” he asked, staring out the window into the vast expanse of nothingness beyond. The view was dominated by the barren fields that extended towards the water of the Arctic Ocean. No animals, no trees, not even a house could be seen before them. Just the lonely shapes of oil derricks bobbing their heads up and down in eternal agreement. So, Jeffrey sat. He looked out the windows, towards the twilight that rested over the land of endless sun. Durnovo twisted an oversized knob that had somehow been built into his seat and a radio clicked on. A singer above Jeffrey’s head began to croon to the sound of a brass band in a language he didn’t understand. “So this place represents isolation?” Jeffrey asked, reaching into the bag at his feet for pen and paper. Durnovo shifted in his seat, laying one arm over the other as he looked wistfully out the window. “No, Mr. Barrow, not quite isolation. Look out there, what do you see? Don’t answer, there isn’t anything to see but the oil derricks. “You see, Mr. Barrow, we are right now sitting on a massive oil deposit to rival those that my great, great grandfather explored at Baku back when we still had a Russian Empire to call our own.” He reached out and tapped the glass, leaving a smudge where his finger had been. Jeffrey was furiously scribbling on his notepad until his fingers began to cramp and the knuckle on his middle finger, where the pencil rested, was rubbed smooth. At last, when Durnovo fell silent again and sipped at his tea, Jeffrey was able to read over what he wrote. 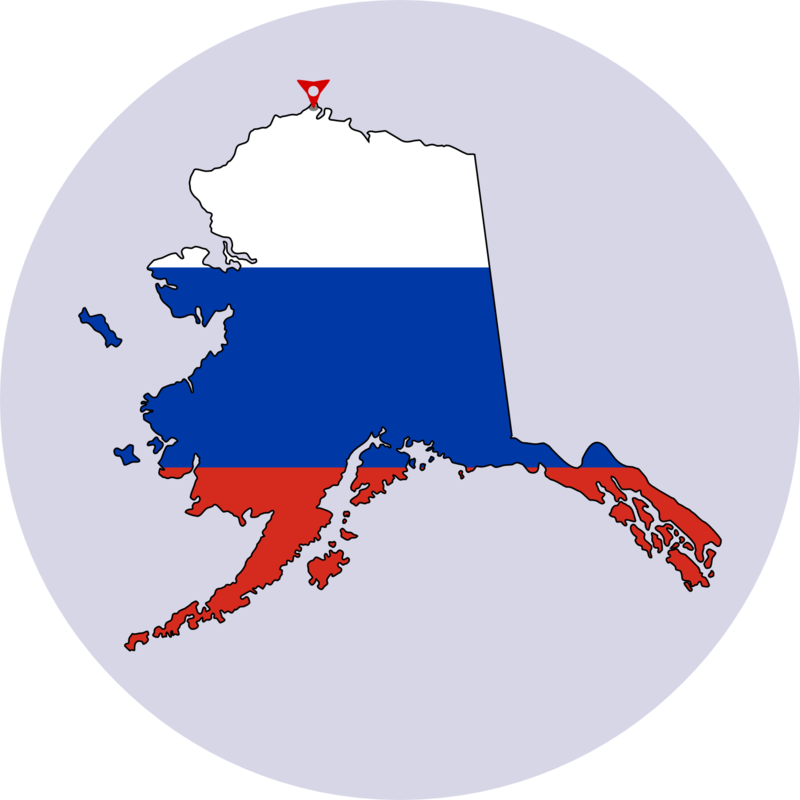 “So what you’re saying is… Alaska still has its sights set on taking back Russia?” he asked. As quickly as the night had begun, it ended. The music ended, the tea was swept away by a servant Jeffrey hadn’t even been aware of, and a massive maroon curtain descended over the viewing window. Jeffrey was escorted quickly out of the building, burlap bag clutched in his hands. Within an hour, he was back on the plane and droning south towards what counted for civilization in Alaska. Once more, Jeffrey sat in a cramped airplane cabin across from a burly man with a rifle sitting on his lap. This time, however, the man looked happy, almost jovial. His eyes were wide open and he cracked a smile now and again—which, for a grizzled man buried in furs like him must have been an accomplishment. The hunter shook his head. “Only wound. Not kill,” he declared and puffed out his chest. Jeffrey sat back in his seat on the rickety plane and thought for a moment about what the hunter had said. In a way, he supposed, Alaska was just a bigger version of a village threatened by the bear. It could poke and wound the Russian bear, maybe, but not kill it. But maybe, that was all they needed for now. Around the pair of men, the airplane droned on through the land of endless twilight, carrying them on across the hopes of Durnovo and back toward the embrace of civilization.